Dump pie filling into pie tin. Sprinkle about 3/4 of cake mix on top in even layer. Pour half can of soda around on top of cake mix. Stir soda into cake mix, leaving the pie filling alone as much as possible. 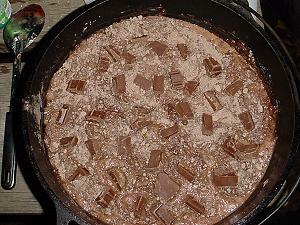 Break chocoloate into small pieces and place on top. Place pie tin in dutch oven, setting it on top of four small pebbles for air circulation. Bake at about 350 degrees for 30-40 minutes, or until the cake looks done when cut or poked. Sprinkle about 1/3 of the cake mix over the pie filling. Then, pour soda right into the cake mix bag and knead the bag with your hands on the outside to mix. Once mixed, pour into the dutch oven. You don't really need the pie tin. You can make it directly in the dutch oven. Let me know how you enjoyed your Black Forest Cobbler!